Creative cities are expensive cities and the space required to store thousands of valuable costume pieces is in high demand from developers. 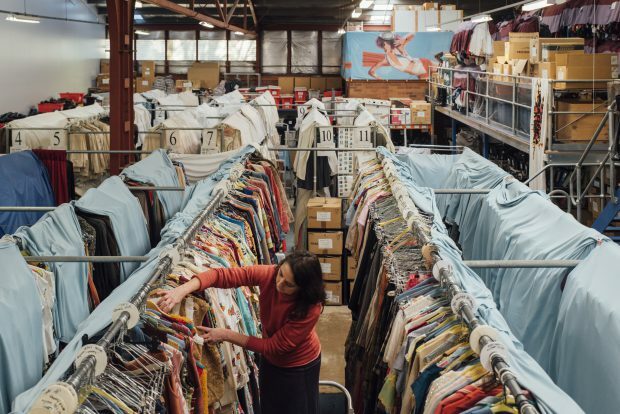 Hero Frock Hire has been supplying the screen industry with costumes for 25 years but is now one of the last costume houses in Australia dedicated to screen. Suzy Carter and husband Mark Lucas started the company in 1992 after buying an existing inventory. Their collection has been seen in Moulin Rouge, Australia, The Matrix Trilogy, Australia, The Pacifiche Great Gatsby, Alien: Covenant and Picnic at Hanging Rock. Hero Frock houses more than 70,000 items of clothing from 1800s to the present in its 600sqm warehouse, sorted and divided by decade. They also have a strong collection of workwear and uniforms as well as everyday clothing from the past 300 years. Only about five per cent of their collection has been purchased while the majority has been donated. But typically when main cast or other seemingly key costumes come in, Carter will try to assess what the potential archival value is likely to be and save them. “It’s not fair to the designer if their work is in somebody’s TV commercial. So I always try to work out what’s significant and I keep that aside,” she says, noting she has in the past gifted costumes back to actors. “This is prime land. It would cost us $100,000 to move and that would wipe us out. So there’s no way that’s happening,” says Lucas, who noted that historically costume houses have closed when forced to relocate.